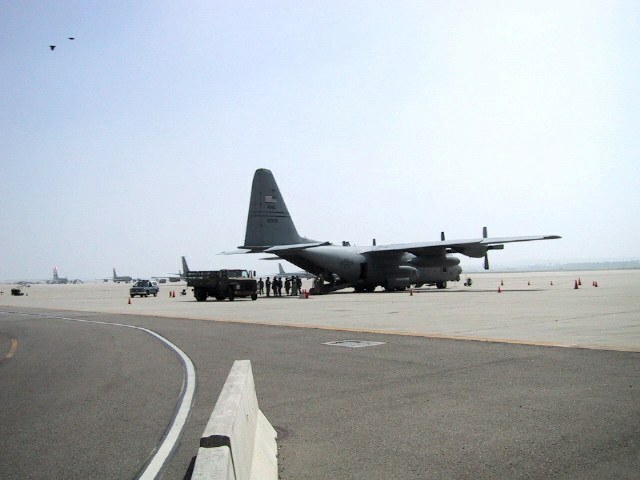 On March 22, 2001, eleven members of ODMT flew to Ontario, California for Rough and Ready 2001. 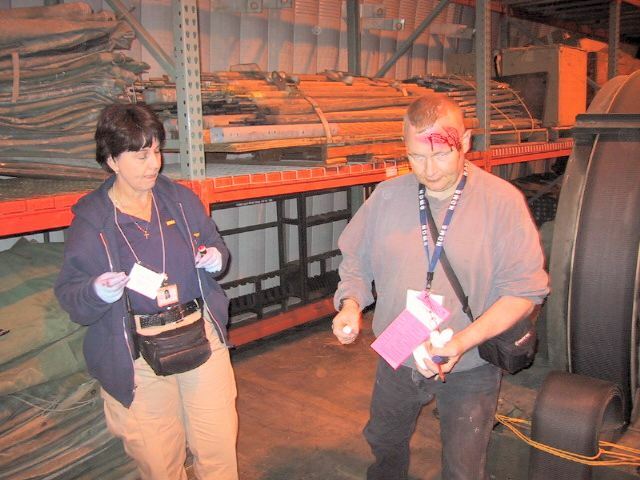 Rough and Ready is an annual California training event that brings together state DMATs and other emergency response groups. 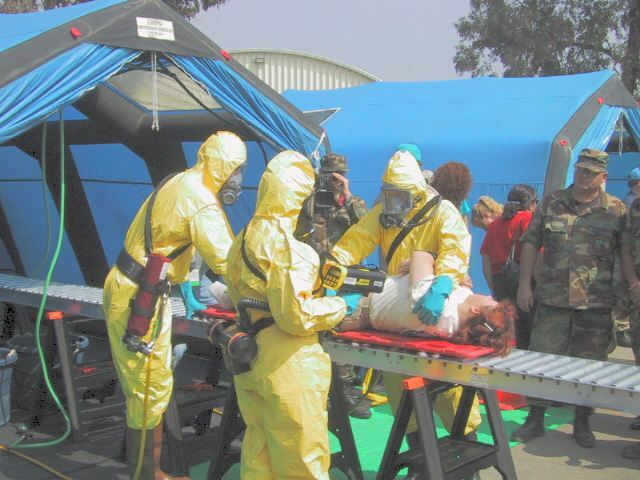 Participating this year were 7 California DMATs, VMAT 4, Orange County and Riverside USAR, Western NMRT, California Air National Guard, California Army National Guard, Air Force Reserve, OEP, USPHS, various California medical agencies, DMAT WA-1, and ODMT. The event was three days. The first day was devoted to camp set-up and communications briefing, the second day focused on classroom training sessions, and the final day was a post-disaster field exercise. The scenario was extreme flooding had prompted evacuation of hospitals and care facilities to March Air Reserve Base. 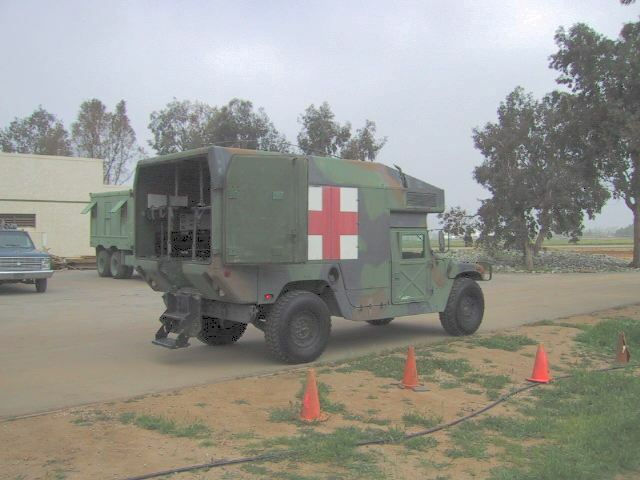 DMATs were activated to provide medical care, and prepare patients for transport to healthcare facilities outside the flooded areas. Rough and Ready was a great learning opportunity for the team, and we'd like to thank the sponsors of the event for inviting us. Here are a few photos from the training. Click on a photo to enlarge it. Use your browser's Back button to return to this page. 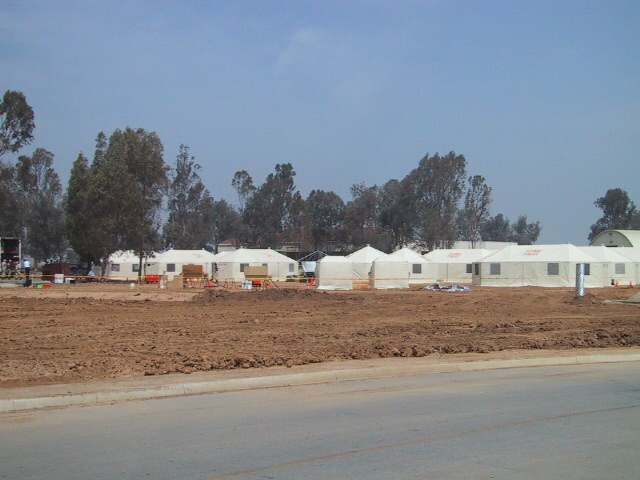 DMAT tent city at March Air Reserve Base - Ontario, California. Orange County's USAR (Urban Search and Rescue) truck and trailer. 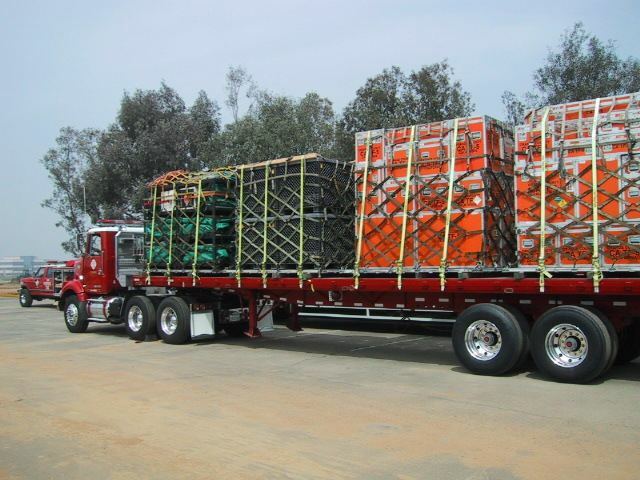 This rig contains administrative and logistic equipment. Another closed semi-truck contains rescue tools. 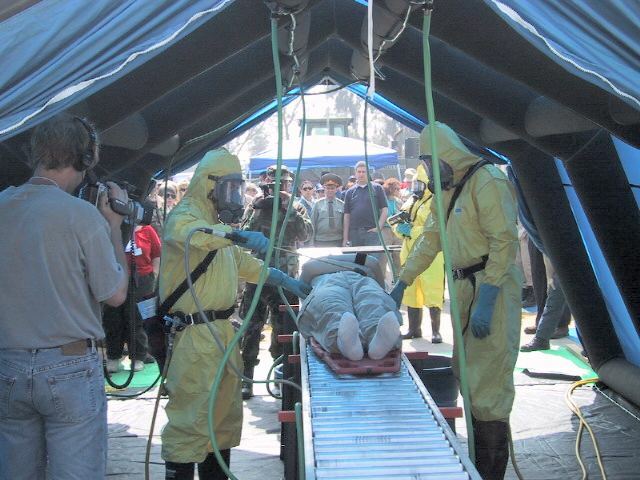 Western National Medical Response Team decon demonstration. In the event of a chemical or biological incident, NMRTs decontaminate patients before treatment by DMATs. 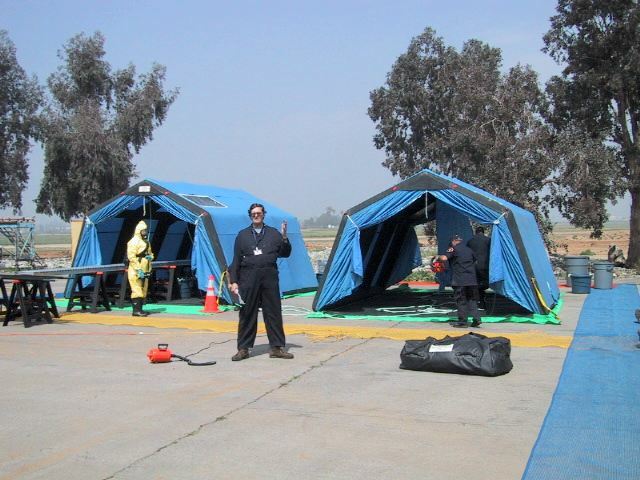 Decontamination processing tent for non-ambulatory patients. Soap and water is used to remove contaminates. During a real incident, the patient's clothes are removed. The last step is to use a monitoring device to check for any remaining contaminates. Once patient are decontaminated, they are transported to the medical treatment area. For the drill, patients were moulaged. Here Steve does a good "Night of the Living Dead" imitation. 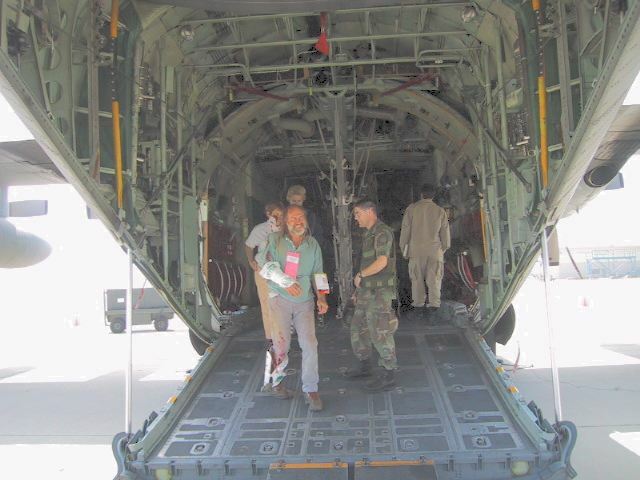 National Guard Humvee ambulances were used to transport the patients to the drill and then to a waiting medevac aircraft. Inside the delayed treatment tent. 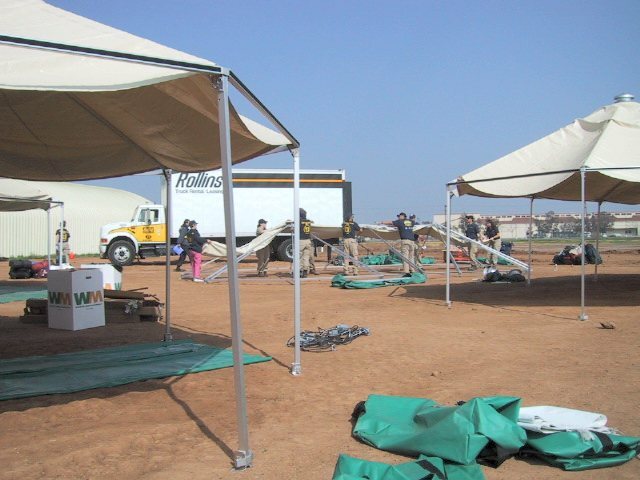 Incoming patients were first triaged and then processed into different treatment tents. 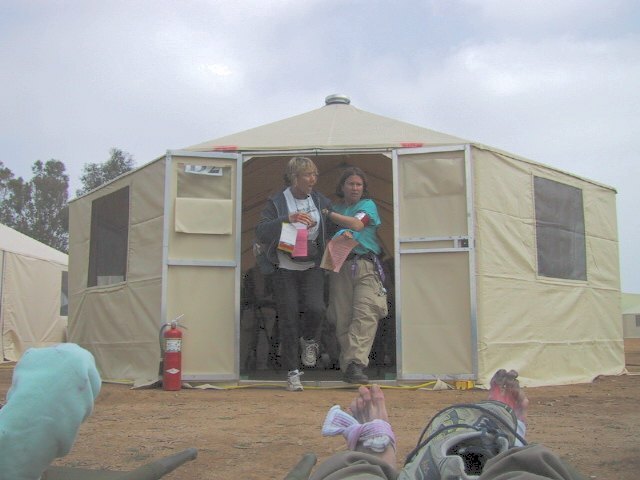 Once inside a tent, depending on their condition, patients could be moved to another tent to receive a higher level of care. 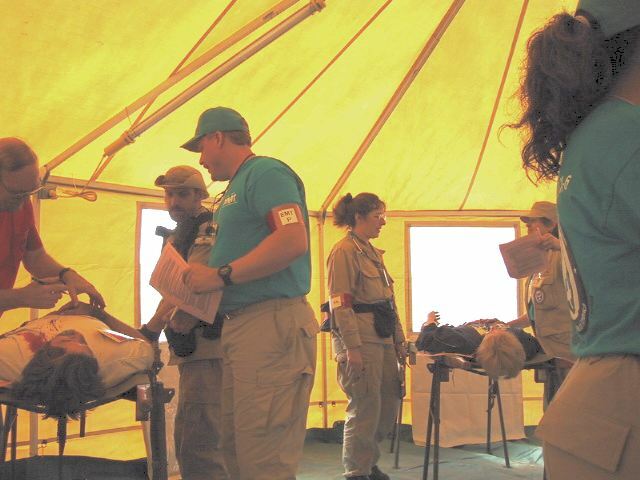 Because of the large number, patients were moved outside the treatment tents into holding areas, awaiting ambulance transport. 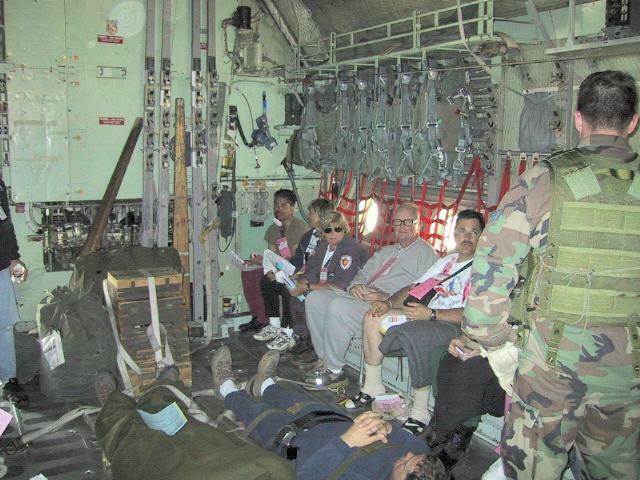 Patients were then moved to a waiting Air Force C-130. The end of the drill. Back to the main camp for debriefing. Tear-down on the last day. Here a Western Shelter is in the process of being folded up and packed away.